Digging in the cupboard of my sewing room for some tracing paper I saw a bag of stuffed fruit on the top shelf. I started making these thinking they would make a nice table center display. In reality my table is covered in cutting boards and fabric, hence they stay in the bag. I never made the apples or grapes. 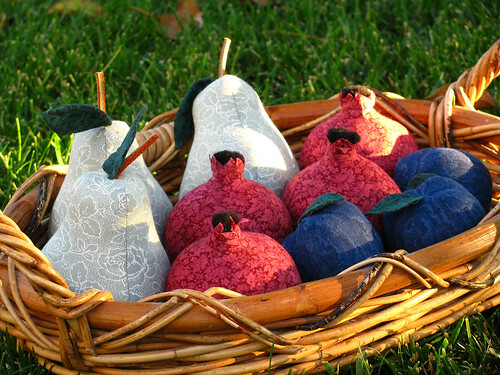 I think it is funny that all the finished ones start with the letter ‘P’; pears, pomegranates, and plums. The colors of these particular fruits together would also offer lovely compositions for embroidery. The variations of different yellows(greens), reds, and purples(blues), are endless. I may start using these stuffed pieces as pin cushions. The pear stems are made of leather shoe laces. The pomegranate bottoms are craft pompoms. This entry was posted on Friday, October 31st, 2008 at 10:16 am and is filed under Craft and Sewing. Tagged: Calico, Craft, Sewing. You can feed this entry. You can leave a response, or trackback from your own site.